Writing – Where Did My Brain Go? 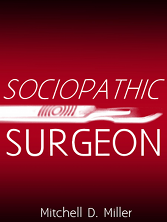 Sociopathic Surgeon is now available on Kobo. It will be on sale for 99 cents from 8/7/14 – 8/17/14. Includes synopsis and review. My thriller Sociopathic Surgeon is 99 cents on the Kindle Store. Read an extended description and reviews. Kiddo Drives Home is a short short story about a young woman who drinks too much alcohol. My book, Sociopathic Surgeon will be free on Amazon from February 28 through March 4, 2013. Sociopathic Surgeon describes the adventures of a sociopathic surgeon and her sociopathic surgeon family. My story is set in the early 1980's. I lived in all the locations and described them accurately. All the medical information, including the certification process, was correct at that time. Please read it now and leave me a review.